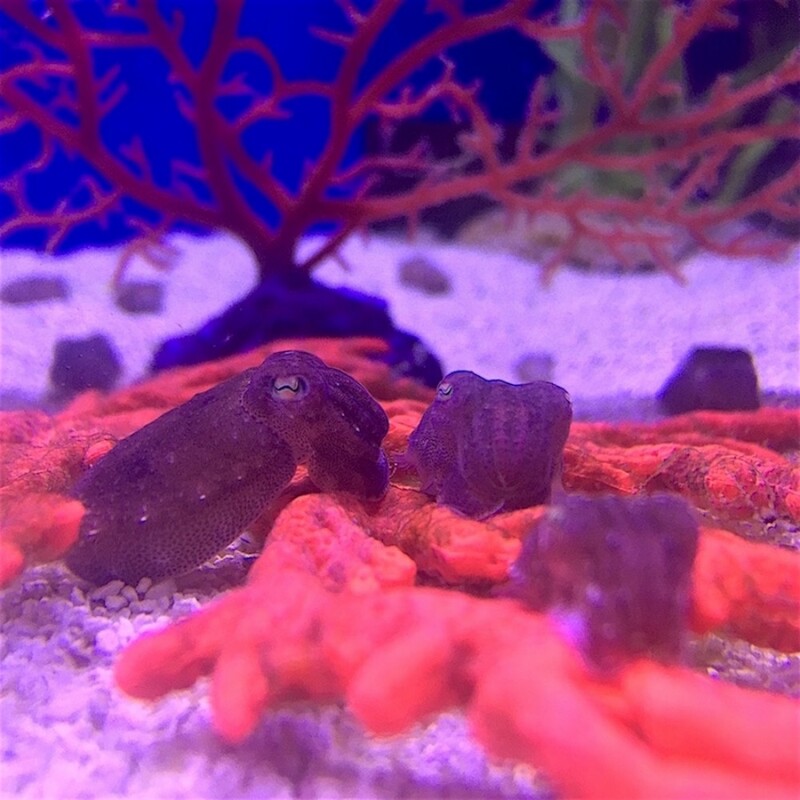 ReefGen is proud to announce the newest member of our family, Captive Bred Sepia officinalis Cuttlefish!! This is an exclusive opportunity that is only being offered to experienced cephalopod keepers. Below are some details on this species. 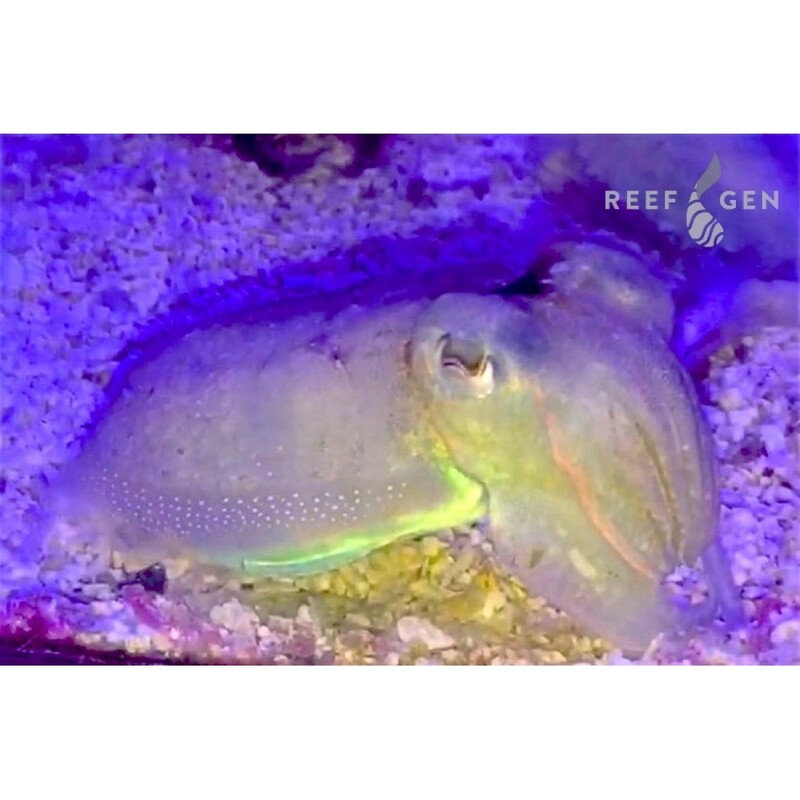 These rare Cuttles will capture the attention of everyone who sees them. They spend a lot of time at the glass with their space-alien like features floating off the ground. We often said that Bandensis are like puppies. If that's the case, then Officinalis are like an excited golden retriever eager to see you every time you appear. 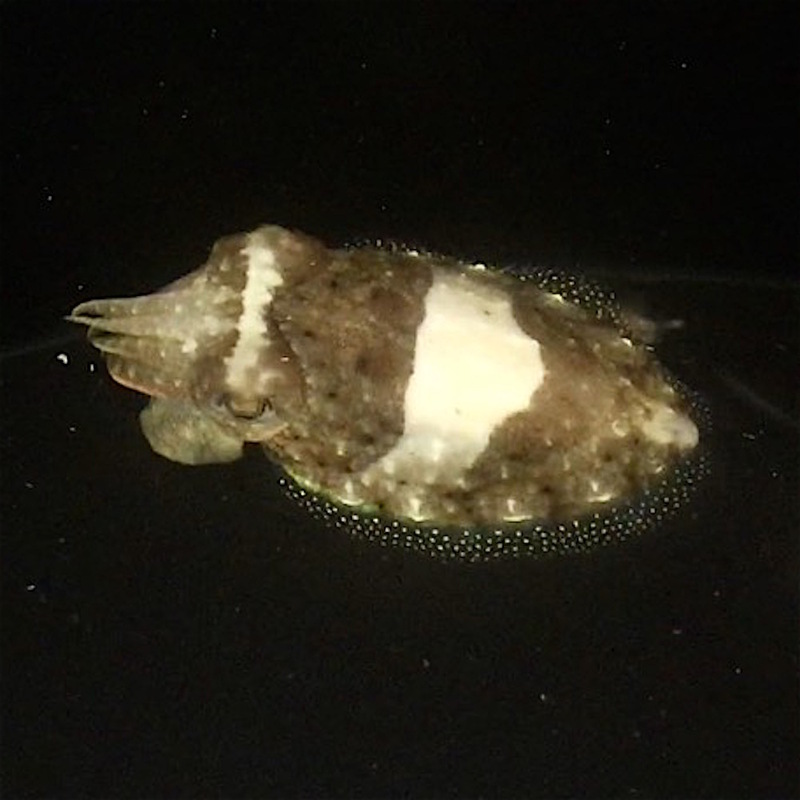 They are much more visible, social, and interactive than Bandensis. Officinalis can grow to over one foot in the wild, but they tend to stay smaller in captivity averaging from six to ten inches. It's not just their size that's larger, their life span is often up to two years!. One of our favorite parts of our new officinalis is that they READILY EAT FROZEN FOODS!! As adolescents, they prefer frozen raw shrimp, prawns, and krill. As they grow, they prefer silversides, capelin and sand eels. We recommend you feed live mysis or live grass shrimp (depending on their age) at first to get them acclimated to their new home. They are incredibly eager to try any food item that enters their tank, even food that’s on the tank bottom (so don’t forget to remove uneaten foods each day.) We recommend you feed them as much as they will eat, at least two times per day. They will be a joy to feed for your staff and provide a fun activity to feed with customers. 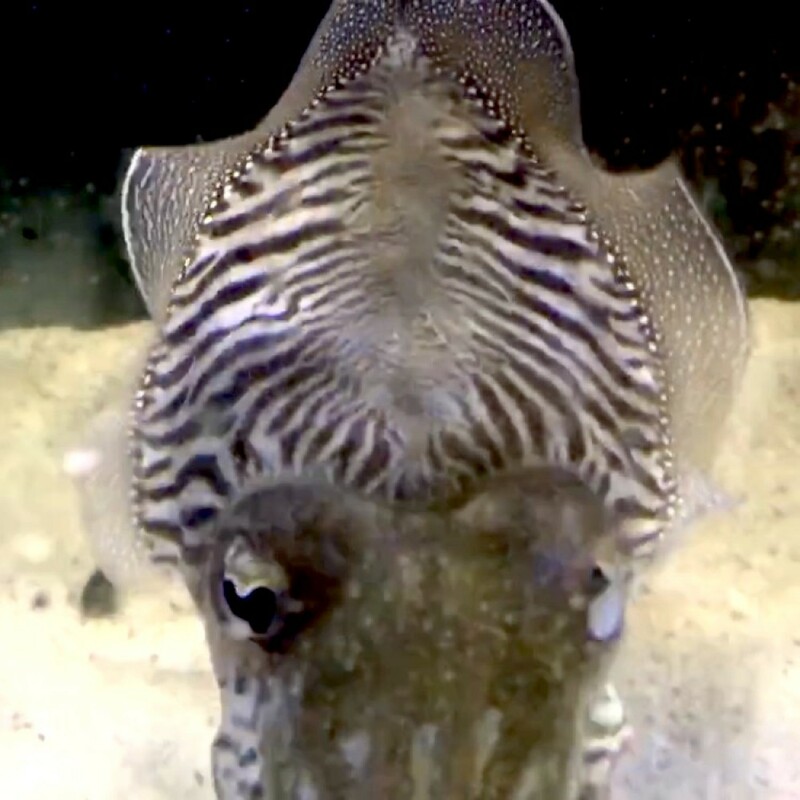 If you are interested in ordering this exclusive Cuttlefish, please notify us. They do best in pairs and groups. Dense grouping is also possible. 75G display for 4, but will require lots of water changes to keep nitrates down. You can comfortably fit 100 x 1-2” juveniles in this tank, but 7” adults get surly and territorial. So plan for grow out areas. We keep ours at 70, and have kept them at 78 in the past with success— until some irritation in water caused rapid and catastrophic wipeout of our population. Raising their metabolism with temperature also raises the reaction time when something goes wrong. 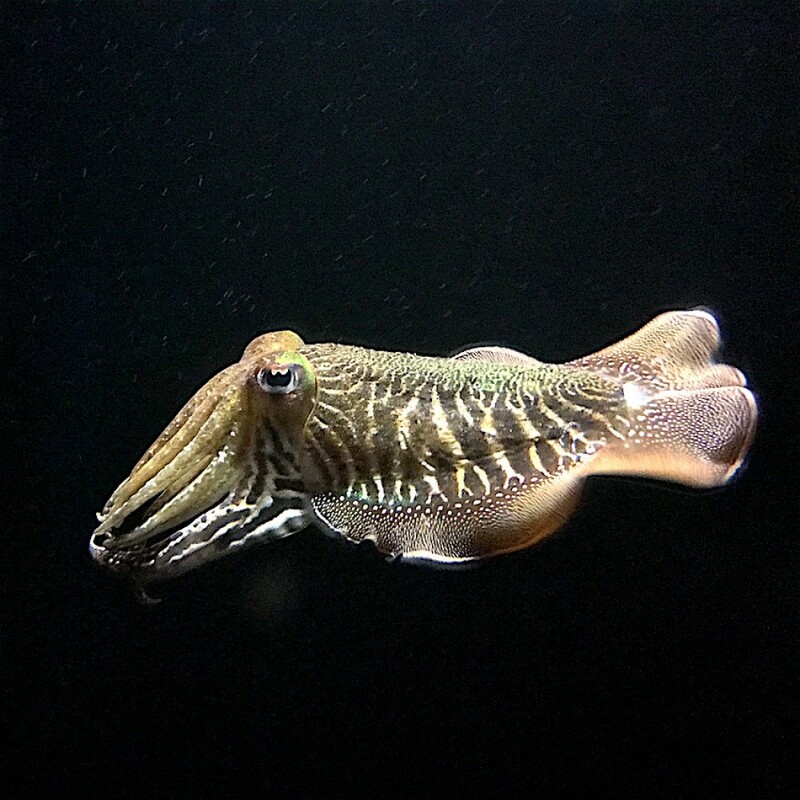 Cuttlefish have a metabolism 200-300% greater than high energy teleosts and elasmobranchs. They produce that much more waste. Plan for nitrates accordingly. Maintain salinity stability with auto top off from a small 5-10G separate and discrete container (do not plumb tank top off valve directly into RO/DI.) Cephs are extremely sensitive to changes in salinity. Ensure nothing in your tank has ever been in contact with copper before. Remember, copper embeds into PVC, rock, sand, and silicone. 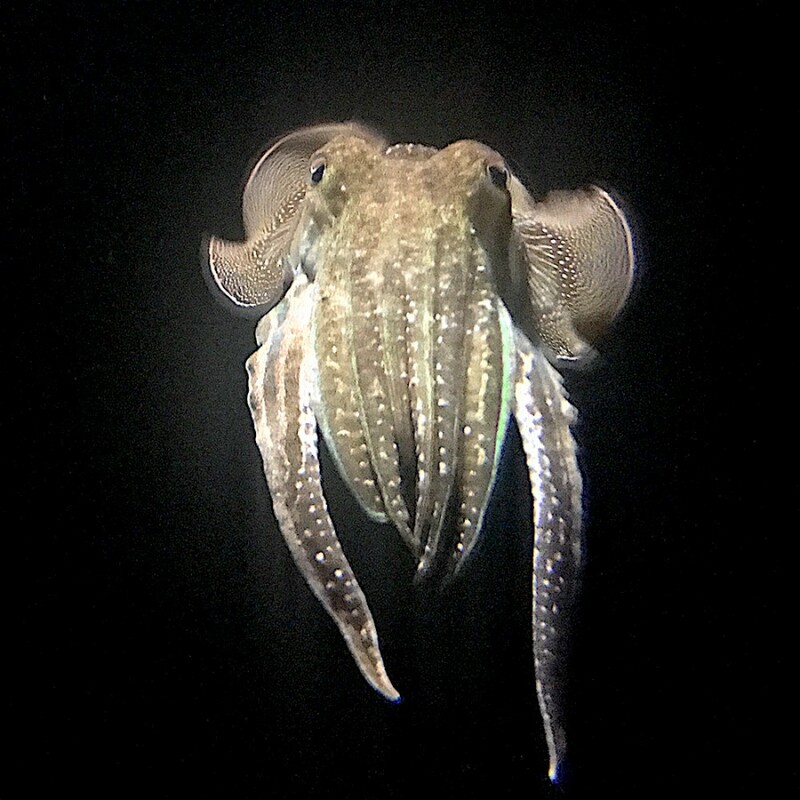 Lighting is unimportant, but some cuttles react poorly to high power LED’s. T5’s and metal halides are safer choices. Water flow is unimportant, but I have seen officinalis enjoy/ play in high flow areas. Lots of open sandy spaces. Use 1-2” of fine aragonite sand on the bottom for adults. Less for babies. Use plastic eel grass for decor and laying substrate. Fake corals etc. ok too. HAVE LIVE FOOD, of the appropriate size, AVAILABLEON THEIR ARRIVAL just in case the chaos of transportation leaves them feeling less adventurous about frozen foods. Don’t leave live grass shrimp unsupervised in a tank with young babies. Grass shrimp will pick and predate on babies. Makes sure the cuttles are of the right size and age to aggressively hunt grass shrimp before trying more than 1 at a time.